The bed is beautiful. As an FYI, the wood is very much on the blue-grey side (as opposed to greige-grey) - which I like... but just a head's up if you are trying to match bed to other grey furniture. Also, the drawers are on the small side (i.e., they do not fill-up the entire footprint of the bed - see pic). I specifically wanted drawers "built-in" to the bed (as opposed to underbed storage containers, or drawers that slide on the ground), so I am fine with their small size. The bed took me ~1 hour to put together (at a fairly lackadaisical pace), from unpacking boxes to screwing in the mattress slats. Doable for one person if you are strong/adept enough to lift-up and position crosspieces at headboard and footboard. As this was my first piece of furniture in my new apartment, I had minimal things to use to "prop up" bed parts while I positioned them - this would have helped immensely. If in doubt, opt for "in room of choice" delivery - the boxes are big and heavy! Give your bedroom timeless style with the beautiful Ediline panel bed from iNSPIRE Q® Classic. Blending a simple, classic look with a contemporary touch, this bed will match almost any decor. This frame is available with one or two sides of easily accessible and spacious drawers, not to mention your choice of six finishes. I have been looking for a strong, solid queen sized bed with solid drawers underneath, for two years. I liked the reviews and look of this bed very much. We ordered the Eldine Queen Platform bed, with two drawers of storage on each side, in Berry Red. It arrived sooner then was expected in the four very heavy boxes (which means solid product to me) as promised. The sides with the drawers completely assembled!! Strong solid drawers they roll smoothly away from the ground, with a felt/velvet like feel on the bottom of each of them. The drawers are large and we were able to put an entire dresser of clothes in the four. 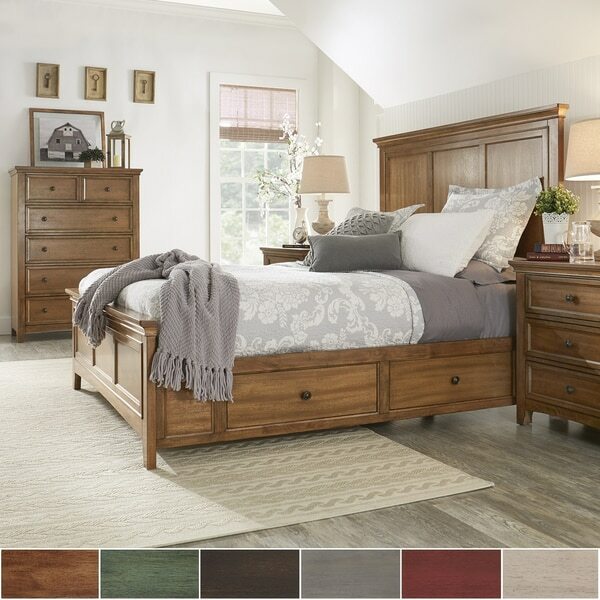 The slats with leg supports and drawers with leg supports along with the strong headboard and foot pad support make this bed feel very sturdy! It’s beautiful and we both slept very well in it the first night! The design and color fit great in what I imagine for remolding our master bedroom. After two years of looking I finally found it! I recommend it! Pleasantly surprised. Couldn't be more pleased with this purchase! Excellent quality, looks Fabulous, and EASY to assemble! Took less than 2 hours from truck delivery, to removing existing furniture, to Assembly, and, to being completely DONE with sheets, pillows &amp; Comforter! BAMM! I was looking everywhere for this bed in sage. I was so happy to have found it here and at such an amazing prize. It comes with the drawers assembled which was great that is always a trying task . Very simple set up and directions were also a breeze . It is a platform bed which is what we needed and comes with the slats for the platform setup. Very sturdy construction of the entire frame drawers included. Beautiful color , the drawers slide effortlessly and are a very good size . I love my bed thank you ! I love everything about this bed as far as color, quality, and size goes. It was way easier to put together than I expected. The wood planks do have to be drilled on, there are no ore drilled holes. I would really like to give it five stars but I live in a very small apt and have been shopping all over for a bed and matching nightstand. I bought the nightstand that goes with the bed but the first drawer on the bed cannot open all the way because it doesn’t align with the nightstand unless you set them far apart which defeats the purpose of the nightstand since you won’t be able to reach for it so I had to work with it and set it far enough to be able to open my bed drawer just a little to be reach in. Kind of upset but will decide to keep the furniture. Bed is well packaged, easy to follow instructions and very simple to put together. Only took my husband and I 35 minutes to unpack and completely put together. Drawers are a decent size and easy to open and close. Seems well constructed. Only complaint I have is that one of the drawer knobs is stripped out so knob keeps coming off when try to open drawer and that is as soon as we unpacked it. Drawers are already assembled when shipped. Will be contacting manufacturers for replacement knob. Other wise really like it. Purchased the antique white with 4 drawers. It is white with gray/black and looks perfect in my gray room. This bed did not disappoint! It took less than an hour to assemble. The storage drawers are a good size, 2 on each side of the bed frame. The color we chose (the darkest color) was exactly as pictured. Great quality for the price.. the drawers are extra sturdy and built well. We are very happy with this purchase. "When will Queen two sides storage in black be back in stock?" "Will the queen 2 side storage be available again in oak?" "For the storage bed, what is the measurement from the floor to the top of the slates? Need to figure out what height mattress I need to match nightstands (8”, 10” or 12”)." The clearance under bed is approximately 3.2 inches. Thank you. But I need the measurement from the floor to where the bottom of the mattress would be (top of slats). "if you request only one side of storage, are you able to choose which side? The bed will be against a wall on one side, so if the drawers are not on the correct side, they would be useless. " Yes, you are able to choose which side the storage drawers are placed. "When will the queen with two sides of storage in white be available again? Thanks!" The white queen size bed with two sides of storage will be available around the end of October. "Do the drawers come assembled?" Yes, the drawers come assembled. "for a queen bed, how many pieces are in the 4 boxes so i can determine if i want professional installation or DIY please?" 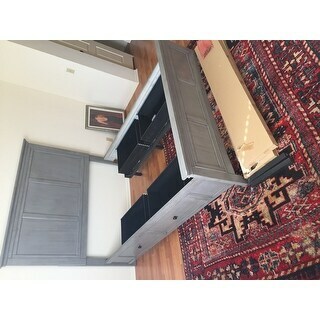 The headboard ships in three pieces, and the rest of the bed ships in approximatly 17 pieces. The assembly is relatively simple, but may require two people.